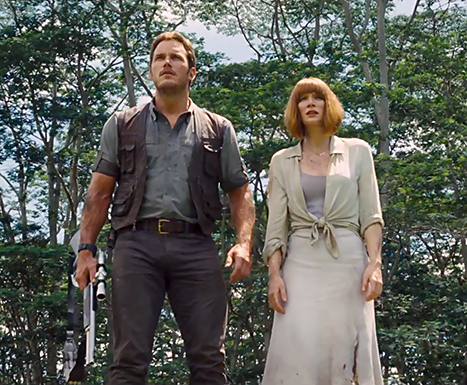 Jurassic World is an assembly line manufactured well-oiled blockbuster machine. There are zero original thoughts, unique dialogue or genuinely unsafe moments despite dinosaurs running rampant attacking families. 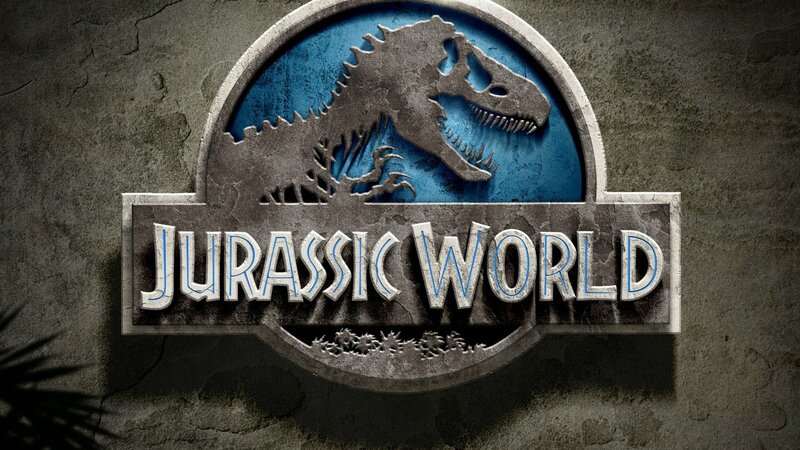 It has an intriguing opening shot with a close up of an egg cracking and out comes a baby dinosaur juxtaposed directly after with snow on the ground where we meet two of our main characters, children that are going to visit their aunt (Bryce Dallas Howard) where she works at the newly renovated Jurassic World theme park where nothing will possibly go wrong. One of the biggest problems with this movie is its banal and predictable plot. People on an island with dinosaurs, something goes wrong, dinosaurs get out, kids in danger, oh no! We’ve seen it before three times already; this one from its screenplay really does not even try to be different. Speaking of the script, Jurassic World has some clever dialogue with innuendo, however all of the dialogue when there is no dinosaur carnage, is so perfectly written to drive plot while developing its characters and relationships it might make one nauseous. Nobody talks like the characters do in this movie outside of a big budget studio blockbuster. This makes it hard to truly escape from reality into a film with danger around every corner but a bow seemingly wrapped on every sentence our main characters speak. Which brings me to the acting; our main actors Chris Pratt and Bryce Dallas Howard are opposites/love interests with obvious sexual tension that you know everything will work out in their favor to kiss at the end from the first moment we see them interact. Bryce Dallas Howard looks great, her designer white dress barely gets dirty despite all of the running around on the island she does and is constantly in high heels even when running from a T-Rex. Chris Pratt receives the clear movie star treatment from the directors set up shot introducing his character basically telling the audience he’s the hero, and he does a very good job as the action star. Pratt has a great charismatic screen presence and a humor about him that translates very well on screen. The hero shots were tailored so perfectly for him that sometimes Jurassic World felt like an audition or a dry run for Chris Pratt to be Indiana Jones. Throughout Jurassic World there are a lot of little homage’s to the previous films, none more pleasant than B. D. Wong reprising his role as a geneticist from the original film. Also worth mentioning are some great moments where the movie pokes fun at corporate names on the island as well as ball parks and many other facets of life. A “Pepsi-saurus” sounds clever and is not too far off from the world this movie creates. The music by Michael Giacchino takes John Williams’ masterful score from the original and uses its themes, appropriately at first then overuses it to the point where I feel it orchestrates how the audience should feel every step of the way. I also liked how Jurassic World deals with themes of nature versus nurture with genetically manufactured dinosaurs. I do not know enough about genetics and cloning but the movie handled those aspects well on a surface level and some of the velociraptors come into their own with personalities and inner conflicts regarding helping the humans or following the alpha dinosaur. What it failed miserably at was the stupidity of the humans. The characters of this world did not learn any lessons from the mistakes made by people in the first three Jurassic films. In each film the dinosaurs keep getting progressively smarter and the people are progressively getting dumber. At this rate, the next Jurassic sequel after this all human beings should be extinct. Check out this scene from The Critic. The dinosaurs are not that far off from being this smart in Jurassic World. Despite all that, the third act of Jurassic World has some unquestionably solid thrills. The last half hour really delivers on the action and suspense that you want to see from a summer blockbuster, it’s just a shame that the first 90 minutes are not as compelling. The last action sequence is like an all-star game crossed with a WWE Royal Rumble with the dinosaurs we met earlier in the film. It’s a lot of fun and I could see myself wanting to watch those scenes again on cable a year from now. Other than that, the special effects are nothing worth commending. These effects were groundbreaking in 1993 when Jurassic Park premiered and they feel very ho-hum today. It’s how they use the effects and nothing was really effective other than the final action sequences. Overall, Jurassic World is nothing special and does not add anything valuable to the film series. With its ‘copy and paste’ plot and ordinary CGI effects the whole movie just felt like a retread. Here is a video of Weird Al Yankovic’s “Jurassic Park” back when a movie like this was groundbreaking and original.